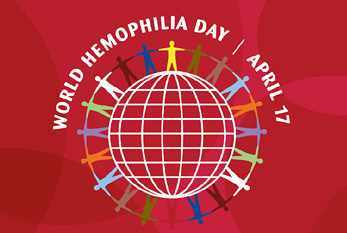 April 17th; World Hemophilia Day is observed every year on 17th April to advocate a global effort to ensure appropriate care and treatment for a disease that is the oldest known genetic bleeding disorder caused by a deficiency in the genes. While the events held were varied, all shared the same cause—to generate awareness about inherited bleeding disorders and to advocate for improved treatment and care. Even as the country emphasizes on headline-grabbing ailments, hemophilia, a little known blood disorder, is turning out to be a plague with over 50,000 people affected. Hemophilia generally transmits at birth from an affected father to daughter, who then becomes a carrier of the hemophilia cells who is at higher risk of passing the defective gene on to her children. The disease is not curable, but with proper knowledge and treatment it can be handled. Bleeding disorders are also considered as clotting disorders. To make it simpler, when you get injured, it begins to bleed. The body system kick starts the clotting phenomenon, which forms a blood clot to stop bleeding. The clotting process in the body is driven by 13 different blood components or proteins called elements and by cells called platelets. A bleeding disorder takes place when there are inadequate amount of platelets or clotting components in the body or they are not working properly. Bleeding disorders can be acquired or genetic. Such bleeding disorders are genetic and can run in several generations of one family. It is a rare condition, stimulated by the deficiency or incorrect function of a single coagulation or clotting component. Such bleeding disorders are more general and varied, stimulated due to a few conditions like chronic liver disorder, or due to side effects of some drugs. Platelet count may diminish due to the presence of medical conditions like leukemia, HIV, kidney failure, liver disorder, multiple myeloma etc. The underlying reason which has triggered the bleeding disorder needs to be resolved, and till such time the bleeding disorder may deteriorate. If the condition is due to the deficiency of Vitamin K, vitamin supplementation may regain normalcy. The treatment will be offered keeping in mind the underlying cause of the condition. Hemophilia A is a rare bleeding disorder associated with X-chromosome, which prominently afflicts males. It is caused due to the deficiency or complete absence of factor VIII in the blood. Women are mostly carriers of this condition, and transmit the condition to male children. Hemophilia B is the second most common kind of bleeding disorder, also termed as factor IX deficiency. The disease is prominently genetic, although in 30 percent of cases, the condition has been reported without any family history of the disease. It is caused by deficiency or absence of clotting factor IX. Bleeding from hemophilia may lead to fatal outcomes hence treatment is necessary. The disease cannot be cured, but it can be lived by having proper knowledge of the disease. This is a significant method to treat hemophilia. In this therapy missing or limited clotting factor is replaced. The treatment includes preventive or prophylactic therapy, which is offered in a regular basis. Demand therapy is conducted only when there is a need to cease bleeding. It is conducted by infusions into the blood streams. Home treatment assists in treating the patient rapidly, thereby cutting down complications. Doctor visits are minimized and also the treatment is inexpensive. A man-made factor Desmopressin (DDAVP) can also treat mild Hemophilia A. It triggers the factor VIII and von Willebrand factor to catapult the protein levels in the blood. Desmopressin is offered in the form of injection or as nasal spray. It is a drug that keeps clots from diluting. These pills are administered prior to dental work, mouth or nose bleeding treatment and for slight intestinal bleeding. Scientists are putting their best efforts to correct the defective genes liable for hemophilia. This gene therapy is still on a trial basis.